به‌منظور بررسی سازگاری برخی اکوتیپ‌های زعفران زراعی (sativusCrocus) نسبت به شرایط اقلیمی شهرستان مراغه، آزمایشی در قالب طرح بلوک‌های کامل تصادفی با سه تکرار و طی دو سال متوالی (1392-1393) اجرا شد. اکوتیپ‌های موردمطالعه شامل بردسکن، سبزوار، تربت‌حیدریه، کاشمر، تایباد، آبرود، دوغ‌آباد، اسفیوخ، مرند 1، مرند 2، بناب 1 و بناب 2 بودند. صفات مورد ارزیابی شامل وزن تر کلاله، وزن خشک کلاله، طول خامه، طول کلاله، درصد سبز شدن، سرعت سبز شدن، ارتفاع گل، درصد گلدهی، سرعت گلدهی، وزن تر و خشک گل و عملکرد خشک کلاله در واحد سطح بود. نتایج نشان داد تمامی اکوتیپ‌ها از درصد سبز شدن و استقرار خوبی در سال اول برخوردار بودند، ولی با شروع یخبندان، اکوتیپ‌های آبرود، اسفیوخ و تایباد سازگاری کمتری به دماهای پایین نشان دادند. بین اکوتیپ‌ها از لحاظ صفات تعداد گل در واحد سطح، درصدگلدهی، درصد سبز شدن و میانگین وزن تر گل در سطح احتمال 05/0 اختلاف معنی‌داری وجود داشت. همچنین اختلاف آماری معنی‌داری در سطح احتمال 01/0 برای سرعت گلدهی و سبز شدن در بین اکوتیپ‌های موردبررسی مشاهده شد. بالاترین درصد سبز شدن در سال دوم مربوط به اکوتیپ مرند 2 بود، ولی اکوتیپ سبزوار بالاترین سرعت گلدهی و بیشترین درصد گلدهی را به خود اختصاص داد. با وجود پایین بودن عملکرد اکوتیپ‌های مرند 1 و سبزوار در سال استقرار، این دو اکوتیپ در سال دوم بیشترین عملکرد را نشان دادند، به‌طوری‌که مقدار تولید سال دوم اکوتیپ سبزوار 5/1 کیلوگرم در هکتار و اکوتیپ مرند 1 4/1 کیلوگرم در هکتار بود. در مجموع، نتایج نشان داد که اکوتیپ‌های مرند جهت کاشت در شهرستان مراغه مناسب بوده و استفاده از بنه‌های خارج از استان توصیه نمی‌گردد. 1Master science in plant production, Maragheh University. 2Professor assistant, department of plant production, Lorestan University. Akbarpour, A., Khorashadizadeh, A., Shahidi, A., and Ghochanian, E. 2013. Performance evaluation of artificial neural network models in estimate production of yield saffron based on climate parameters. Journal of saffron 1 (1): 27-35. (In Persian with English Summary). Alizadeh, A., Sayari, N., Ahmadian, J., and Mohamadian, A. 2009. Study for zoning the most appropriate time of irrigation of saffron (Crocus sativus L.) in Khorasan Razavi, north and southern provinces. Journal of Water and Soil 23 (1): 109-118. (In Persian with English Summary). Amooaghaie, R. 2006. Low temperature storage of corms extends the flowering season of saffron (Crocus sativus L.). Mashhad, Iran: Proceedings of the Second International Symposium on Saffron Biology and Technology. Association of Official Seed Analysts. 2010. AOSA rules for testing seeds .AOSA, Ithaca, NY. Behdani, M., Nassiri, M., and Koocheki, A. 2003. Modeling saffron flowering time across a temperature gradient. Albacete, Spain: In proceeding of 2nd international Symposium on saffron biology and technology. Behnia, M. 2011. 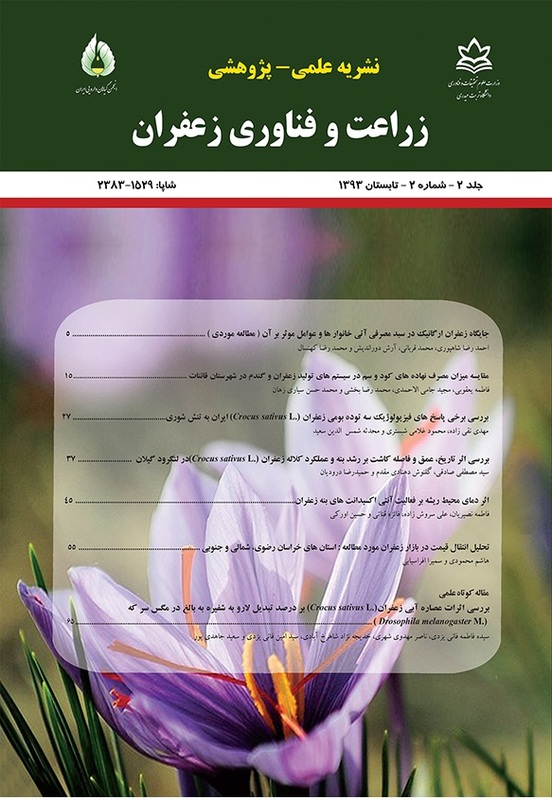 Saffron (history, botany, chemistry, manufacturing, technology, standard consumer fraud and Marketing): Tehran University Publication. 530 pp. (In Persian with English Summary). Blaauw, A. 1935. DePeriodicke on Twling Van Een Boliris. Verhadel- ingder Koninklijke Akademie Van Wetensch Appen Afdeeling. Caiola, M.G., and Canini, A. 2010. Looking for Saffron (Crocus sativus L.) Parents. Global Science Books. pp: 1-14. Douglas, M., and Wallace, A. 1997. Evaluation of saffron (Crocus sativus L.) production in New Zealand. New Zealand Journal of Crop and Horticultural Science 25: 159- 168. Douglas, M., Smallfield, B., Wallace, A., and McGimpsey, J. 2014. Saffron (Crocus sativus L.): The effect of mother corm size on progeny multiplication, flower and stigma production. Scientia Horticulturae 166. pp: 50–58. Fernandez, J. 2004. Genetic resources of saffron and allies (Crocus spp.). Acta Horticulturae: II International Symposium on Saffron Biology and Technology. Foladi Toroghi, A.R., and Hosseini Mazinani, S.M. 2013. Investigate the possibility of cultivation and development of saffron (Crocus sativus L.) in the climatic conditions of Ray. Journal of Plant and habitats 9: 79-90. (In Persian). Gresta, f., Lombardo, G., Siracusa, L., and Ruberto, G. 2008. Saffron, an alternative crop for sustainable agriculture system. A review. Agronomy for Sustainable Development 28 (1): 92-112. Halevy, A., Han, S., Sachs, R., and Reid, M. 1991. Flowering and corm yield of brodiaea in response to temperature, photoperiod, corm size, and planting depth. American Society for Horticultural Science 116 (1):19-22. Halford, I. 1973. Phosphate adsorption by soils and its relationship to soil phosphates and plant availability. Ph.D. thesis London Uiversity. Husaini, A.M., Hassan, B.Y., Ghani, M.A., Teixeira da Silva, J., and Kirmani, N. 2010. Saffron (Crocus sativus Kashmirianus) Cultivation in Kashmir: Practices and Problems. Kashmir. pp: 108-115. Kamyabi, S., Habibi nokhandan, M., and Rohi, A. 2014. Effect of climatic factors affecting saffron using analytic hierarchy process (AHP); (Case Study Roshtkhar Region, Iran). Torbat Heydareh: Jornal Saffron 2 (1): 75-90. (In Persian with English Summary). Karasawa, K. 1940. Karyological studies of saffron. Japanese Journal of Botanym pp: 129-140. Keyhani, J., Keyhani, E., and Kamali, J. 2002. Thermal stability of cataleses active in dormant saffron (Crocus sativus L.) corms. Molecular Biology Reports 29: 125-128. Khajepoure, M. 1997. Saffron Cultivation. Esfahan University of Technology Publications Isfahan, Iran. 30 pp. Koocheki, A., Jamshid Eyni, M., and Seeyedi, M. 2014. Study the effects of manure, chemical and mother corm size on the characteristics of daughter corms and yield of saffron. Saffron Agronomy and Technology 2 (1): 34-46. (In Persian with English Summary). Molafilabi, A. 2004. Experimental finding of production and ecophysiological aspects of saffron (Crocus sativus L.). Acta Horticulture 650:195–200. Molina, R., Valero, M., Navarro, Y., Guardiola, J., and Garcıa-Luis, A. 2005. Temperature effects on flower formation (Crocus sativus L.). Spain: Scientia Horticulturae 103: 361–379. Morata, B., Nebauer, S., Sanchez, M., and Molina, R. 2012. Effect of corm size, water stress and cultivation conditions on photosynthesis and biomass partitioning during the vegetative growth of saffron (Crocus sativus L.). Industrial Crops and Products 39: 40-46. Pazoki, A., Karaminejad, M., and Foladi Targhi, A. 2011. Effects of planting dates and genotypes on yield of saffron. Crop Physiology Journal 2 (8): 3-28. Pederson, P., and Bhhaedwaj, S. 1993. Effect of seed vigure and dormancy on feild emergence, development and grain yield of winter wheat (Triticum aestivum L.). Journal of Seed Science Technology 21: 159-178. Sepaskhah, A., and Kamgar-Haghighi, A. 2009. Saffron irrigation regime. International Journal of Plant Production 3 (1): 216-222. Shahrokhi, A., Ghaeid amini Haroni, M., and Khodakarimi, A. 2010. The effect of climate change behavior flowering Saffron. National Conference on Climate Change and its impact on agriculture and the environment. pp: 1-6. (In Persian). Shokohian, A., and Asghari, A. 2008. Evaluate the adaptability ecotypes of saffron in climate Ardabil. Journal of Agriculture Science 2 (18-2): 1-8. (In Persian). Sobhani, B. 2011. The Evaluation of agricultural climate saffron cultivation in Ardebil. The First National Conference on Agricultural Meteorology and Water Management. pp: 1-10. (In Persian). Turhan, H., Fatih, K., Cem, O.E., and Muhammet, K.G. 2007. The effects of diffrent growing media on flowering and corm formation of saffron (Crocus sativus L.). African Journal of Biotechnology 6 (20): 2328-2332.